Fall is officially here, and that means its time to unveil your latest sweater finds from your local thrift shop, and time to get nice and cozy with aromatic and herbaceous whites, and fresh reds that start to lean towards tannins. Rather than limit our focus to a specific producer or region, we’ve opened up this first of fall sale to include some of our newest favorites. Let’s get into it. We start in the reaches of Northwest Italy, near the city of Turin in the Upper Piedmont. The Canavese region is the farthest reaches of Piedmont before the Valle d”Aoste Here in the hills is where we find Luigi Ferrando, whose family has been involved in winemaking traditions since 1900. The Erbaluce grape is an ancient white variety that originates, and can only be found, in the alpine foothills of this northwestern corner of Piedmont. It has a bright acidity, an elegant underlying minerality, and a complex structure that makes it the ultimate flexible wine: producing everything from sparkling wine, through bone-dry, off-dry, and late harvest wines. Being found only around Caluso, Erbaluce doesn’t quite get the name recognition as other Italian white varietals like Pinot Grigio and Verdicchio or Soave (Garganega) or Gavi (Cortese), but as a high-acid white wine, it is well worth seeking out either for its good use as alternatives to the preponderance of New Zealand Sauvignon Blanc, as well as its ability to age. This outstanding example comes from Ferrando’s vineyards in the town of Borgomasino from vines around 35 years of age. During the fermentation process the grapes are destalked and then fermented in stainless steel vats for 15 days with cultured yeasts and goes through elevage for 6 months before slight filtering and bottle aging for 12 months before release. The exceptionally saturated, golden color kicks off some substantial legs upon swirling. While un-delineated and essentially closed aromatically, the forceful, viscous texture kicks in the second this juice touches the palate. The texture is oily, yet lively, as flavors of flowers, kiwi, green apple peel, quince paste and honeysuckle power their way from cheek to cheek, leaving an almost fuzzy feel on the back of the tongue. Still in its infancy, this rich yet balanced white will be a fun one to watch as it evolves in the bottle. 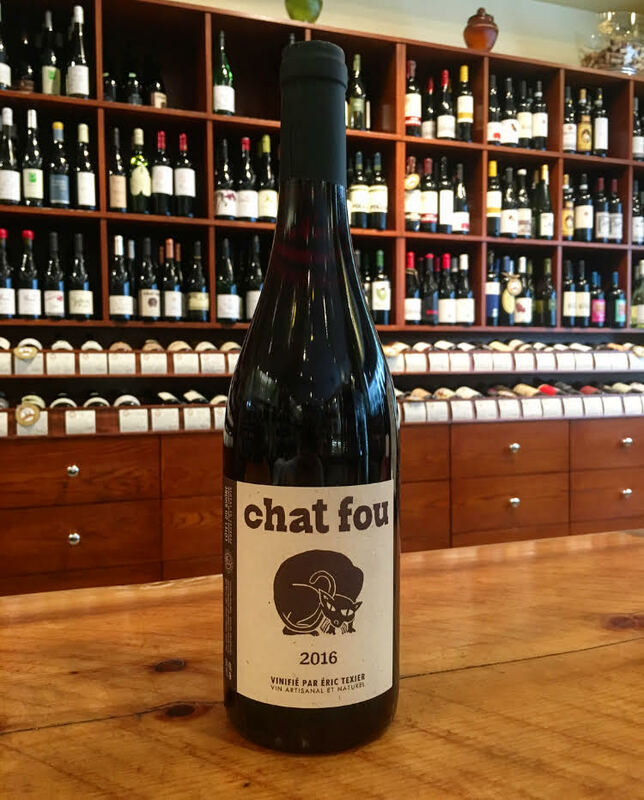 What translates as “crazy cat” refers to one of our favorite wines from an outstanding producer in the Rhône. A Bordeaux native and nuclear engineer by trade, he’s become one of the region’s most dynamic winemakers. The Chat Fou comes not only from his own vineyard plots in St. Julien and also from the Vaucluse . 85% Grenache/15% Clairette/Viognier/Chasselas. Most of the Grenache and all of the white come from the granite soils of Texier's St.Julien-en-St.Alban vineyard; some of the Grenache comes from his holdings in Vaison-La-Romaine in the Vaucluse. The whites and red are co-harvested and co-fermented mainly as whole clusters with native yeasts in concrete tanks with a short 5-day maceration and without any punchdowns. The wine is aged for around a year in concrete tank and bottled with a very small dose (15g/liter) of sulfur. The intention is a fresh, light style of Côtes-du-Rhône. Around the wine world, you may have heard the term “glou-glou” passed around, referring to the easy drinkability of wines and we’ve found no better fit for the term than this wine, which manages to provide superb freshness and a heck of a lot of fun in an organic wine. Heresy, from where we get the term heretics, refers to a practice that is strongly at variance with established beliefs or customs, in particular the accepted beliefs of a church or religious organization. André Iché inherited a 13th century castle and estate (as one does in France) and began making wines for the local cooperatives around him in the Minervois, part of France’s Languedoc Region and became so beloved for his winemaking ability, that even Robert Parker praised him as the maker of “the perfect bistro wines”. Though André passed away in 2007, his daughter Marie-Pierre took over the winemaking responsibility, and she makes this bottle in a tongue and cheek reference to the bylaws of wine coming from the Minervois. Technically, Carignan must make up no more than 40% of any blend from the Minervois to be labeled as from the Minervois. Since Les Hérétiques is made up of 100% Carignan, it is a VdP, a label created for wines that don’t follow the AOC rules, and that’s partly the reason for the name. The other reason is a reference to the Siege of Minerve in 1210, when the Catholic Kingdom of France besieged the Cathars (viewed as a heretical sect) in Minerve. Sourced from vines over 40 years of age, Half of of the wine is fermented in barrel with a maceration of 30 days. The other half is made by carbonic maceration. With a medium body and notes of blackberries and raspberries and just a hint of tannins, this is a perfect fall food wine. Situated in the Cotes de Grandlieu sub-zone of Muscadet, where the mouth of the Loire meets the Atlantic, we find the organically certified vineyards of Domaine Les Hautes Noëlles. 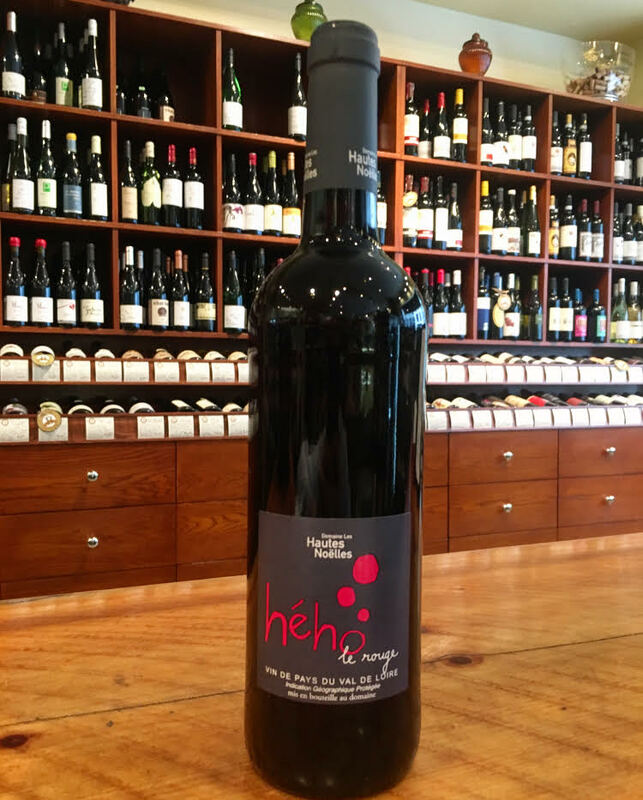 Though Muscadet is best known for its fresh expressions of Melon de Bourgogne, the Hého Rouge is an organic blend of the more prominent red grapes of the region - 45% Cabernet Franc, 45% Grolleau Noir, and 10% Gamay. The Grolleau Noir and Gamay go through carbonic maceration, Cabernet Franc is vinified traditionally. It’s rich with flavors of red currants and strawberries with a floral finish and one of our favorite current alternatives to the ubiquitous cheap Pinot Noirs. Back in Minervois, in the region of Corbieres, we come upon a winery built on the ruins of an ancient Roman vineyard. This biodynamically farmed bottle of 100% Carignan from 100 year old vines is more rich and tannic than the Chateau d’Oupia offering, and practically begs to be matched with a lamb burger with notes of tart red and black berries and hints of mushrooms.